My radon is about a 7 and my basement is dry. I lived in my new house for 10 yrs and never had any water collect in my basin system that the builder installed in my basement. With all the rain we had last yr and some new homes being built behind my house, I decided to buy a sump pump just in case an issue arises. I am considering your polycarb - basin lid. I am also considering a radon fan. I also was going to install a fan in my basement to push out the damp cold air and pull down the conditioned air from up stairs. This inspiration came from another web site. The person whom recommended this idea of pulling down conditioned air noted that he didn't have to run two dehumidifiers. Instead, it was more energy savings to run a "low- CFM" exhaust fan. The key to the energy savings was to keep the inlet air duct as close to the basement floor as possible. The basement is going to be a family room in the near future. So, do I need two fans or can i get away with one. I'm sure you have experienced similar situations. Please help me choose the correct fan and hardware. A radon system will often help with dampness and humidity levels during wet parts of the year. It can't though compete with high soil moisture migrating through your foundation and floor which doesn't seem to be an issue In your home with a dry sump. 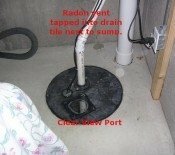 So a radon fan can help but you need to focus the suction from a sealed sump system not from above the basement floor. Since there are almost always some leakage in the walls and floor the radon fan will also be pulling down some air from the home. Thus causing a similar effect like the dehumidifier fans you refereed to. 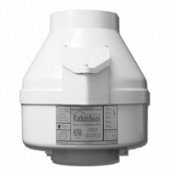 If your basement is around 1200sq/ft I would use the RP145 fan with a radon level of 7pCi/L. Also the RP140 is worth considering with your basement size. This fan uses about half the energy of the RP145. I recommend using a 4" vent for your system. If you go down through the page from the link below you'll get a good idea of the materials you may need from me. Click on the photos to go to the different pages in my store.